The Coalition for Democratic Renewal (CDR) is a global initiative of a group of intellectuals, activists, and politicians, concerned with the expansion of power and influence of authoritarian regimes and the simultaneous weakening of democratic systems from within. The CDR was officially launched in Prague on 10 October 2017. The founding document of the CDR is the Prague Appeal, which up to now has been signed by 180 people. The signatories include well-known and influential writers, academicians, political actors and civil society activists from different countries across the world. The director of International Partnership for Human Rights (IPHR), Brigitte Dufour has signed the appeal and attended the launch of the CDR in Prague. The text of the appeal is available below. Liberal democracy is under threat, and all who cherish it must come to its defense. Democracy is threatened from without by despotic regimes in Russia, China, and other countries that are tightening repression internally and expanding their power globally, filling vacuums left by the fading power, influence, and self-confidence of the long-established democracies. The authoritarians are using old weapons of hard power as well as new social media and a growing arsenal of soft power to create a post-democratic world order in which norms of human rights and the rule of law are replaced by the principle of absolute state sovereignty. Democracy is also being threatened from within. Illiberalism is on the rise in Turkey, Hungary, the Philippines, Venezuela, and other backsliding democracies. In other countries – even long-established democracies – support for liberal democracy has eroded in recent years, especially among younger people who have no memory of the struggles against totalitarianism. Faith in democratic institutions has been declining for some time, as governments seem unable to cope with the complex new challenges of globalization, political processes appear increasingly sclerotic and dysfunctional, and the bureaucracies managing both national and global institutions seem remote and overbearing. Compounding the difficulties, terrorist violence has created a climate of fear that is used by despots and demagogues to justify authoritarian power and restrictions on freedoms. Such problems have caused widespread anxiety, hostility to political elites and cynicism about democracy – feelings that have fueled the rise of anti-system political movements and parties. These sentiments, in turn, have been stoked and inflamed by authoritarian disinformation, which increasingly penetrates the media space of the democracies. The latest Freedom House survey shows that political rights and civil liberties have been on the decline for eleven consecutive years, and this year established democracies dominate the list of countries suffering setbacks in freedom. Collectively, these factors – the geopolitical retreat of the West, the resurgence of authoritarian political forces, the erosion of belief in democratic values, and the loss of faith in the efficacy of democratic institutions – have brought a historic halt to democratic progress and threaten a possible “reverse wave” of democratic breakdowns. Democracy’s supporters must unite to halt the retreat and to organize a new coalition for its moral, intellectual, and political renewal. The starting point of a new campaign for democracy is a reaffirmation of the fundamental principles that have inspired the expansion of modern democracy since its birth more than two centuries ago. These principles are rooted in a belief in the dignity of the human person and in the conviction that liberal democracy is the political system that can best safeguard this dignity and allow it to flourish. Among these principles are fundamental human rights including the basic freedoms of expression, association, and religion; political and social pluralism; the existence of a vibrant civil society that empowers citizens at the grass roots; the regular election of government officials through a truly free, fair, open, and competitive process; ample opportunities beyond elections for citizens to participate and voice their concerns; government transparency and accountability, secured both through strong checks and balances in the constitutional system and through civil society oversight; a vigorous rule of law, ensured by an independent judiciary; a market economy that is free of corruption and provides opportunity for all; and a democratic culture of tolerance, civility, and non-violence. These principles are being challenged today not only by apologists for illiberalism and xenophobia, but also by relativist intellectuals who deny that any form of government can be defended as superior. Although democracy is often considered a Western idea, its most fervent defenders today are people in non-Western societies who continue to fight for democratic freedoms against daunting odds. Their struggles affirm the universality of the democratic idea, and their example can help bring about a new birth of democratic conviction in the world’s advanced democracies. Despite its intrinsic value, democracy’s survival cannot be assured unless it can demonstrate its ability to help societies meet the challenges of a changing and unstable world. We acknowledge the deep anxiety and insecurity of large segments of democratic societies and believe that democracy will be strong only if no group is left behind. While democracy embodies universal values, it exists in a particular national context, what Vaclav Havel called the “intellectual, spiritual, and cultural traditions that breathe substance into it and give it meaning.” Democratic citizenship, rooted in such traditions, needs to be strengthened, not allowed to atrophy in an era of globalization. National identity is too important to be left to the manipulation of despots and demagogic populists. The defense of democratic values is not a luxury or a purely idealistic undertaking. It is a precondition for decent, inclusive societies; the framework for social and economic progress for people throughout the world; and the foundation for the preservation of international peace and security. A new Coalition for Democratic Renewal will serve as a moral and intellectual catalyst for the revitalization of the democratic idea. The goal is to change the intellectual and cultural climate by waging a principled, informed, and impassioned battle of ideas; defending democracy against its critics; working to strengthen mediating institutions and civil associations; and fashioning persuasive arguments for liberal democracy that can shape the course of public discussion. It will also be necessary to go on the offensive against the authoritarian opponents of democracy by demonstrating solidarity with the brave people who are fighting for democratic freedoms, and by exposing the crimes of kleptocrats who rob and oppress their own people, falsify the political and historical record, and seek to divide and defame established democracies. 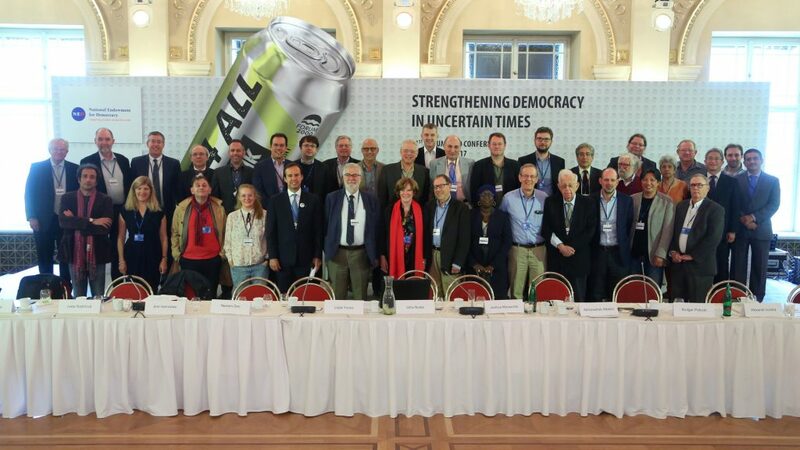 The Coalition will also be a broad and interactive forum for the exchange of ideas about the best ways to address complex new challenges facing democracy such as static or declining living standards for many citizens, the backlash against increased immigration, the rise of “post-truth politics” in an age of social media, and the erosion of support for liberal democracy. Such a global hub would also advocate and promote effective forms of action to revive faith in the efficacy of democratic institutions. There is no excuse for silence or inaction. We dare not cling to the illusion of security at a time when democracy is imperiled. The present crisis provides an opportunity for committed democrats to mobilize, and we must seize it.